Grappa is a unique distillate in the world, in being obtained from the distillation of a solid raw material: the vinaccia (marc), i.e. the skins of grapes remaining after the grapes are pressed to make wine. Mainly two types of marc are sent to the distillery: fermented and non-fermented (virgin). The former has an alcoholic content because it has fermented with grape must, whereas the latter is nearly always white and, save for rare exceptions, not fermented with the grape must. Therefore it is up to the distiller to ferment it in the most suitable way before distilling it. Why is this fermentation necessary? Fermentation is very important because it is the process by which an organic substance (usually sugar) is converted into alcohol by single-cell micro-organisms: the yeasts. To create a distillate (Grappa, Cognac or Whisky, etc.) it is always necessary to start with a substance already containing alcohol, or a fermented substance. Distillation is a physical process enabling the separation of the volatile parts of the fermented product, according to their different boiling points. 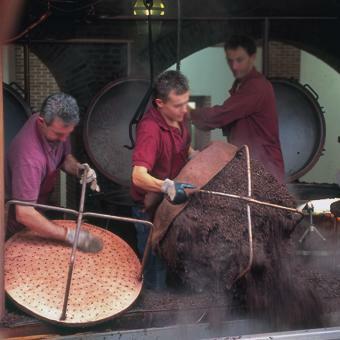 In practice, it is necessary to heat the fermented product to allow the alcoholic vapours to evaporate together with the aromas. In this way, the quantity of alcohol contained in the fermented product becomes concentrated. If these vapours are condensed, a liquid of high alcoholic content is obtained. • discontinuous-cycle stills, used for artisan production of Grappa (flowing steam pots still, double-boiler ‘bain-marie’ stills, direct fire still). Only the stills used for the hand-made production of Grappa will be described here.